Siphon or Vacuum style coffee is one of the more fun, tasty alternatives to your traditional brewing methods. In the name of good coffee, we spent 18 hours testing out 12 different siphon coffee makers on a quest to brew the ultimate cup of joe. As a result, we’re extremely confident in recommending the Hario “NEXT” model as the best siphon coffee maker on the market for most coffee lovers looking to try out a more artisanal method of brewing. For those who wish to make the most out of their coffee beans, nothing can beat the results of using siphon coffee makers. Take it from me, a cup of coffee that was processed using a siphon brewer delivers one of the most flavorful and richest tasting coffee you have tasted. While using siphon coffee makers will require some effort, once you have gotten the hang of it you will be able to blend some wonderful tasting coffee right at home. Since your search has brought you here I would assume you are already interested in getting a siphon coffee maker of your own. To help you in your search I’ll be giving you some important pointers on what to look for in a siphon coffee maker as well as giving you my take on the top siphon / vacuum coffee makers available today. Using siphon coffee makers require some skill and a delicate touch. It might take more than one triy, but once you have perfected this process you can create a coffee that is similar in taste to a high-end coffee shop. All of this right from the comfort of your own home. First thing’s first, you should know that there are two types of siphon brewers available in the market – the standalone and stovetop siphon brewers. It is actually easy to distinguish one from the other as the main difference between the two is their heat source, as stated in their names. Standalone siphon brewers utilize an external heat source to process coffee beans. It typically uses either alcohol or butane gas burners. A standalone siphon coffee maker is made to be portable and be brought anywhere. This makes this type a good choice if you enjoy a good outdoor activity like camping. The stovetop siphon brewer, on the other hand, requires a dedicated source of heat, such as an electric stove or your main gas line. When using the stovetop siphon coffee maker, it is imperative that you use a diffuser to help mitigate heat exposure which can damage the gas line that connects your coffee maker to the heat source. It goes without saying that the stovetop siphon coffee maker is strictly for indoor use only. When it comes to choosing the right siphon coffee maker you should always start with the material used in the construction of the machine. While stainless-steel and brass siphon brewers are considered as the traditional kinds, they usually cannot compare to modern siphon brewers. Nowadays, these types are relegated to ornamentals and luxury appliances. Modern siphon brewers are made of high-quality glass, specifically borosilicate glass. Borosilicate glass is durable and heat resistant making them a good material to be used in making siphon coffee makers. While they will obviously not survive a fall from your kitchen counter, overall, they offer a long shelf life if maintained properly. The standard filter used in siphon coffee makers are made from cloth. If you have talked to someone who owns a siphon brewer with this filter then they might have told you how difficult it is to clean the filter after every use. This is where most of the hassle comes for siphon brewer owners. It is vital that you clean the filter after every use to prevent mildew from growing. The good news here is that some of the modern siphon brewer models have shifted successfully from cloth filters to stainless-steel filters which are considerably easier to clean. You should look for siphon brewers that utilize this type of filter if you want to save time on the cleaning process. As stated earlier in this article, you get to pick between two kinds of siphon coffee makers; the standalone and the stovetop. Once you decided which one to pick you should also be aware as to what type of burner is compatible with your siphon coffee maker. Most siphon coffee makers are designed to compatible with butane, alcohol, and gas. Some of the more advanced models are compatible with electric and halogen burners. The new types that use this type of burner are, predictably, more expensive than their more traditional counterparts. While you might be inclined to choose alcohol burners due to their cheap price, know that it is actually quite difficult to control the temperature of this burner. It will take some practice to nail the heat down when making coffee. Not only is it difficult to gauge, alcohol burners are also known for leaving soot underneath siphon brewers. If you want a reliable burner without paying an exuberant amount of money for halogen and electric burners, go for butane or gas types. Those two already have a solid and reliable track record and are reasonably priced as well. Don’t be discouraged by naysayers who claim that siphon brewing is difficult. Actually, difficult is not the right word. Time-consuming is a more apt description. If you look at the step by step guide on using siphon brewers you will see that it is actually a simple process. You simply pour water in the bottom portion, heat it up until the water rises up the upper portion. Pour your coffee and do a quick stir and wait for at least a minute. Once the bowl starts to cool down it will a create a vacuum that will siphon the water. Now that you have an idea of the important factors to look for when it comes to thermal carafes, it is time to further nudge you towards the right direction and give you a list of the most popular models on the market today. These 5 models are the cream of the crop as far as we’re concerned, based on our extensive testing process as well as third-party feedback from other consumers. Option to choose either cloth or metal filters. Comes with its own stirrer and measuring cups. The metal filter was actually a bit difficult to clean. The Hario “NEXT” Syphon Coffee Maker introduces a couple of modern features to Hario’s traditional design. For one, the handle was ergonomically designed for a better grip. It uses a smooth rubber coating to provide improve traction on your palm and it doesn’t heat up as well. The bottom chamber’s design also saw an upgrade as it now comes with a volumetric marking that indicates the 400 to 600 milliliters levels. Hario siphon coffee maker lids have always been designed perfectly which is why it is no surprise the “NEXT” utilizes the same lid design. “NEXT” also lets you choose between using a metal filter or the traditional cloth filter. Cloth filters deliver a crisp and clean result while metal filters leave a more textured flavor. It’s good they let you choose between the two filters as you get more flexibility in your coffee brewing. Quite an elegant and classic design. It earns that “Luxury” name. It has a specific style that might turn off some buyers. The eye-catching aesthetics of the Nispira Belgium Balance Siphon Coffee Maker can definitely be considered one of its biggest selling point. However, don’t mistake this siphon brewer as just a pretty face. The classical looking siphon brewer also produces one of the best tasting coffee today. I also enjoyed how the Nispira is basically a homage to classic siphon coffee makers of yesteryear. The elegant and sophisticated appearance hides the fact that within the brewer is an up to date machine. The chambers are not on top of one another, unlike most siphon coffee makers, instead, it is placed beside each other. The Nispiria can be quite complicated to operate at first, especially if you are used to using modern siphon brewers. That being said, this luxury siphon coffee maker makes the list of the best siphon brewers at the moment. It is quite expensive but it is definitely worth every penny both in looks and performance. Here we have another entry that is considered to be a “luxury” model. 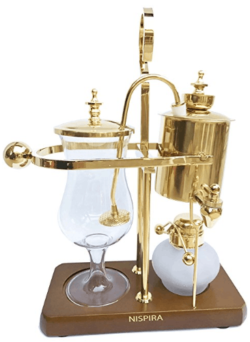 It captures that elegant appearance of siphon brewers of days gone while managing to measure up with today’s more competitive models. The Diguo Belgian Luxury Siphon Coffee Maker comes with all the essential features you expect in a modern siphon brewer. You also get a free glass cup and measuring spoon that also has the same aesthetics as the machine. Construction uses some pretty sturdy material. The stainless-steel water chamber feels durable and is quite easy to clean. It features a quality wooden board that holds the glass container and burner. This wooden board base helps improve overall protection of the glass chambers. Surprisingly enough, this machine is actually easy to maintain and operate. Something not common with ‘luxury’ siphon coffee makers. 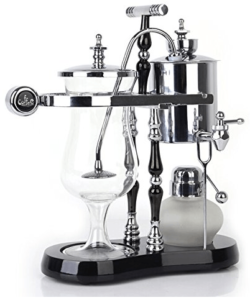 If you want to spice up the overall aesthetics of your kitchen and have the extra cash to spend, why not look at what Diguo Belgian Luxury Siphon Coffee Maker has to offer? Affordable yet delivers good quality coffee brewing. Makes full use of one barrel of alcohol burner. You can save time by pre-boiling the water first before brewing your coffee. If you are looking for something a little bit budget-friendly, the Kendal Glass Tabletop Siphon Coffee Maker is a good option. I liked the lightweight design of the Kendal Glass. It also feels well-made despite the affordable price tag. This siphon brewer is designed to be user-friendly and it shows when you operate it. It does come with an alcohol burner and it manages to maximize the use of one barrel of alcohol burner as you can prepare at least 10 pots of coffee brew. I did find the upper chamber to be a bit flimsy. I suggest you handle that section with care when cleaning it. 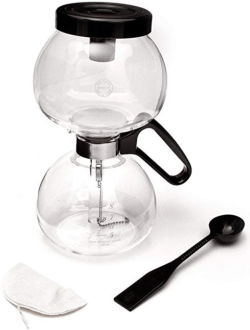 Overall, the Kendal Glass is a great introductory siphon coffee maker. It’s cheap but delivers good quality coffee. The simple and minimalist design makes it a user-friendly siphon coffee maker. Susceptible to boiling over and spilling outside the chamber. Stovetop siphon coffee makers require more effort to clean. One of the best siphon coffee makers you can get today, the Yama Glass is a stovetop brewer that produces one of the richest tasting coffees you can make in your own home. You can choose between two size variations of this siphon brewer, the 20 Oz, and the 32 Oz. What I love about the Yama Glass is that it is extremely easy to use and has a minimalist design which makes it a perfect fit for the modern homes of today. The Yama’s coffee brewing capability, while being a relatively affordable model, can easily compete with high-end siphon brewers. If there is one aspect that the Yama seems to fall short in, it is in durability. Since this utilizes glass material for its chambers you expect it to be fragile. However, the glass feels thinner than what other siphon coffee makers in the market have. I guess this is the compromise Yama made in order to offer this at an affordable price. That being said, if you handle it with care you can expect it to last for quite some time. It is even designed to dishwasher and microwave safe. I do need to warn you that the Yama Glass tends to have issues when it comes to water boiling over. You need to be careful when filling the bottom chamber to make sure it won’t spill out once it starts to boil. All 5 of the above models are perfectly sufficient siphon / vacuum coffee makers. Each is slightly different in what it provides, and your final choice depends largely on how much you have budgeted for your new siphon maker. No matter your choice, you won’t be disappointed with any of our top 5 picks.